Mumbai apprentice agitation: Protesting students call off stir; services between Matunga, Dadar resume - Integration Through Media ....! 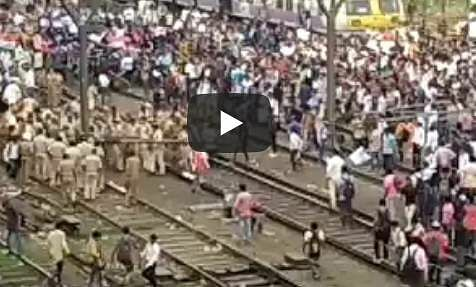 MUMBAI: A flash agitation by job-seekers over issues pertaining to railway recruitment has culminated in a rail-blockade, police caning and retaliatory stone-throwing leading to a virtual paralysis of the Central Railway suburban train services here on Tuesday. 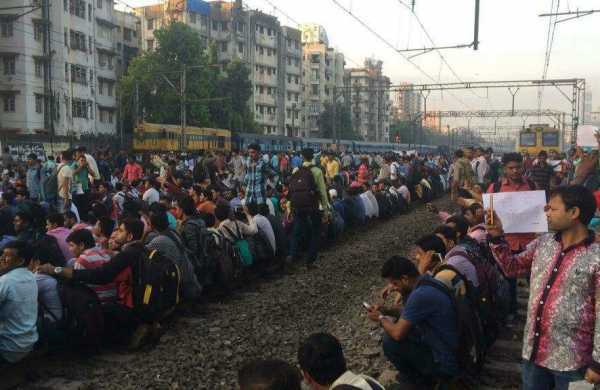 For nearly three hours, the services were severely disrupted as the protestors squatted and laid on the railway tracks between Matunga and Dadar. According to the latest information, the services are now resumed. However, the agitating railway job aspirants are still present at the spot where they have been protesting, between Matunga & Chhatrapati Shivaji Terminus railway station. Confirming that agitators have called off their protest, Railway minister Piyush Goyal told ANI that further discussions will be held. "Recruitment in Railways is underway at a large scale. On directives of the Supreme Court, Indian Railways has made a recruitment policy that is unbiased and transparent," he said. Maharashtra CM Devendra Fadnavis was quoted by ANI as saying, "Was in continuous touch with officials. No rules have changed, 20 per cent seats are reserved for apprentices but they are demanding more. Lathi-charge was done after agitators started pelting stones, no one was injured." More than 4.5 million commuters were badly hit for the second consecutive day follwoing a strike called on Monday by drivers of cab aggregators and app-based taxis that disrupted in Mumbaikars' schedules. "There is no provision of giving jobs to the apprentices as per the Apprentice Act. They are given only training of a specified period to improve their skills and experience of having worked in the field. However, Ministry of Railways have taken a decision and reserved 20% of the seats filled through direct recruitment. The notification is already issued with last date of submitting application as 31.3.2018. Apprentices can apply against this notification and Special Examination will shortly be held for Apprentices who have done training in Railway Workshops under Apprentices Act," the Central Railways stated in an official communique. Meanwhile, in an attempt to restore normalcy, the local police had to resort to a mild lathi-charge to disrupt the protestors. Some retaliated by pelting stones at the police. At least five persons and a couple of police personnel were injured in the fracas even as top police and railway officials rushed to the site to control the situation. The protests were carried out by activists of the All India Act Apprentice Association (AAAAA). It demanded scrapping of the 20 per cent quota in favour of a higher one and sought jobs for locals in all states to those candidates who clear the All India Railway Act Apprentice Exams. They claimed they had taken up their demands right upto the Railway Minister Piyush Goyal who met them but there was no progress in the matter. Meanwhile, the BEST has deployed extra buses to ferry commuters to and fro from various points. The agitation on the Central Railway had a cascading effect even on the Western Railway with all trains running packed to capacity.